If you’re looking for a new and reliable kerosene supplier, look no further than Crown Oil. We’ve been supplying domestic customers and businesses with a range of fuels, oils and lubricants for over 70 years. Running low on kerosene is never going to be an option if you want to ensure a warm and cosy home, business or organisation premises. So you’ll always want to ensure that you’re putting your trust in a kerosene supplier who can ensure delivery when you need it most. As the temperatures drop, the thermostats go up, so always be sure to check your oil storage tank(s) to ensure you’re never allowing yourself to run low on kerosene. 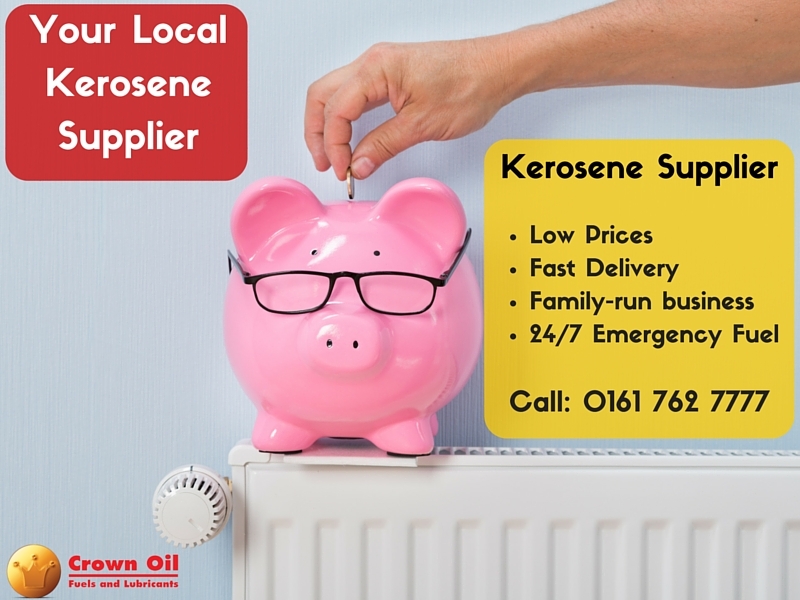 We can supply kerosene heating oil to homes, businesses and organisations. To discuss your requirements or to request a quote, simply give us a call today on 0845 313 0845 to speak with one of our friendly team. No matter whether you’re a business or organisation, or a domestic customer ordering kerosene, finding a new local kerosene heating oil company to supply your home, business or organisation is often most people’s preference for a national fuel supplier. Here at Crown Oil, we’re known as being a national fuels, oils and lubricants supplier. We don’t deliver directly from our main depot in the North West to the UK, instead, we have strategically placed fuel depots across the UK. Although we’re a national supplier of kerosene, our local fuel depot hub drivers all have real local knowledge which ensures we’re able to give all of our customers a truly local service. It also helps to ensure we can cut down on the number of delivery miles our drivers undertake each year. We can supply any business or organisation across the UK from our local oil depots, so you won’t have to wait long before your next top-up. For our domestic customers, our current delivery areas cover the Northwest of England. So if you’re looking for a local kerosene delivery company, one that is able to deliver in quantities ranging from 500 litres up to 36’500 litres or more, get in touch with us today to discuss your requirements. Give our team a call today on 0845 313 0845, and one of our kerosene heating oil experts will be more than happy to help you. As a business or organisation, it’s highly likely that you cannot afford to run low or even out of kerosene. Should the worse happen and you find yourself low on kerosene, we can supply you with an urgent delivery on a same-day basis to ensure you’re refuelled without delay. We have a nationwide network of fuel depots can get to work supplying your emergency heating oil delivery today! Unsure why you should buy kerosene from Crown Oil? Of course, there are many reasons why our customers choose to order their kerosene from Crown Oil. Here are 7 reasons why we believe you should choose Crown Oil to supply your kerosene. We have over 70 years’ experience in giving you, the customer, what you want when you need it. And most importantly of all… the personal touch. A dedicated account manager will look after you and use their knowledge of the oil markets to advise you on the best times to buy your oil.